Fish stock, also called fume in French, is a magnificent base for making soups, chowders, seafood risotto, and any number of sauces. But you may shy away from making your own stock because it is disproportionately labor- or time-intensive. You're not wrong when it comes to beef, veal, or poultry stock, but fish stock happens to be the exception. 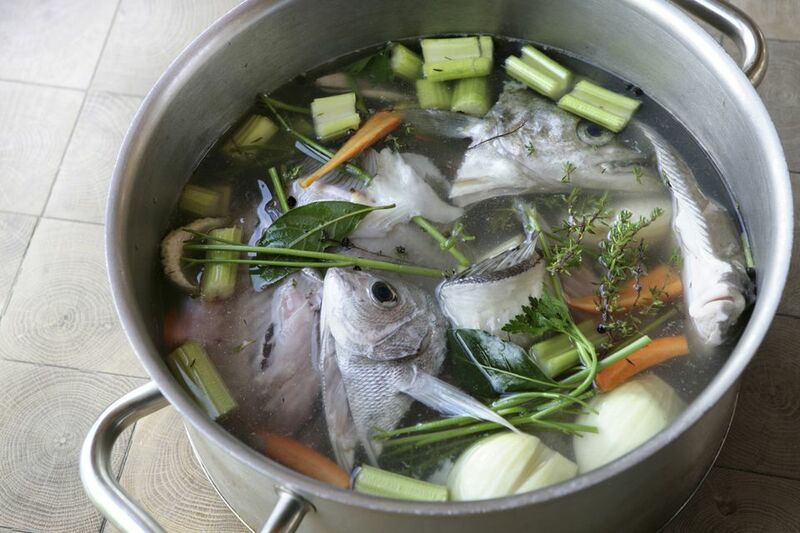 Unlike chicken stock or beef stock, fish stock is quick and easy to make; rather than simmering away for hours, requiring continuous skimming and fussing, fish stock takes just 30 minutes on the stovetop. Although certain recipes will use chicken broth instead of fish stock, such as a simple clam chowder, using the fish stock will really enrich the seafood dish and bring a complex level of flavor. Based in French cuisine, fume is an important ingredient in several French sauces, such as Normandy sauce. It will also contribute a wonderful flavor when poaching fish and is the basis to Spanish Basque seafood stew. Make a sachet d'epices by tying the thyme, peppercorns, clove, parsley stems, and bay leaf into a piece of cheesecloth. Set aside. In a heavy-bottomed stock pot or soup pot, heat the butter over medium heat. Lower the heat, add the celery, carrot, and onion and warm very gently, with the lid on, for about 5 minutes, or until the onions are softened and slightly translucent but not brown. Add the fish bones, cover the mixture with a piece of parchment paper, and re-cover the pot, letting the bones warm gently until they're slightly opaque. Remove the lid and the parchment; add the wine and turn up the heat until the stock starts to simmer. Add the sachet and the water, heat to a simmer, and let cook for 30 to 45 minutes. Strain (you can remove fish bones first if that makes it easier), cool, and refrigerate. Use it to make a seafood bisque, etouffee, or gumbo.